Climate Change has already affected many parts of the world, making many developing countries more vulnerable due to both high exposure to climate related hazards and lack of overall capacity to adapt. Within countries, cities face the most risks due to urban characteristics such as high concentration of people and properties. Also, many cities are not able to manage rapid urbanization well resulting to lack of basic services for the people, and increasing urban poor. This makes urban areas more vulnerable to climate risks. As such, it is vital to implement effective measures for climate change adaptation and risk management among cities, above all, in developing countries. A type of tool that has been recently leveraged in this regard is ICT or Information and Communications Technologies. ICTs are technologies that can collect, analyze, store, and communicate data and information. Many governments have already adopted ICTs to improve public service delivery including climate action. The use of ICT by the government is called 'E-Governance'. With respect to climate action, the use of ICTs contribute, in general, through facilitation of climate related data and information. However, studies that link ICTs with climate change adaptation and risk management have been limited so far. Hence, this study aims to contribute in this area by looking into the state of ICT diffusion, or what and how ICTs are being used within the e-governance for climate action. 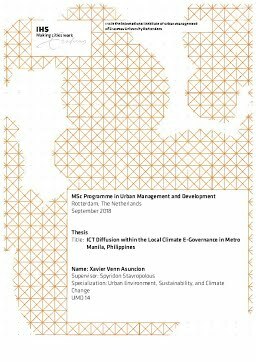 This study specifically focuses at the local government level through the case of Metro Manila, Philippines which is among the countries in the world with high climate risk vulnerability and slow e-governance progress. This study employed both quantitative - survey and descriptive statistics, and qualitative - case study and process tracing analysis, measures to describe ICT diffusion within the local climate e-governance. This study found that the most used ICT for Metro Manila is social media followed by wireless broadband technologies, Geographic Information Systems (GIS), and mobile technologies. Aside from these, many LGUs also make use of web-based (e.g. NOAH and MSDI) and mobile-based (e.g. Batingaw) applications. In terms of quality of use, the findings suggest medium to high extent of use which means, according to this study's parameters, that some LGUs utilize ICTs just for effectiveness and efficiency while others deem ICT-use to be crucial in the achievement local climate e-governance tasks, specifically monitoring of climate change and impacts, disaster management and climate change adaptation. The case of Marikina revealed three (3) main processes where the use of ICTs could lead to climate change adaptation and risk management: 1) facilitating execution of tasks; 2) collecting data/information; and 3) processing and analyzing data/information. However, the findings also suggest, with the current state of diffusion among Metro Manila LGUs, ICTs do not necessarily play a crucial role in the actual achievement of climate change adaptation and risk management objectives but makes their accomplishment more effective and efficient. The biggest barrier to ICT adoption among Metro Manila LGUs is lack of ICT-specialists or inadequate ICT-capacity of personnel and officers. For this reason, this study recommends implementation of incentive schemes to attract ICT-specialists to work for LGUs and to conduct ICT-related capacity-building activities for members of LGUs. The case study revealed that one of the underlying issues to ICT adoption for climate e-governance is the seeming gap between the ICT-capacity of the LGUs and their climate action responsibilities. Many more advanced ICTs are operated at the national level but major climate action responsibilities are devolved to LGUs. As such, the LGUs do not reap the benefits of collecting and analyzing firsthand climate-related data. The general recommendation therefore is to ICT Diffusion within the Local Climate E-Governance in Metro Manila, Philippines 4 integrate ICT-use into the climate action framework of the whole government to better align the distribution of ICTs with the national-local government dynamics for climate action.